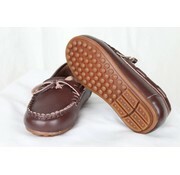 These loafers are made with genuine leather and are hand stitched to near perfection. They're lightweight and have a soft insole that your boys will love. These loafers are excellent quality and made to last.